As Christians, we believe that each person is created by God, in his own image and likeness and therefore we value each individual and accept that we have a duty to do all we reasonably can to promote their welfare, safety, spiritual growth and protection from harm. the care and nurture of, and respectful pastoral ministry with, all children, young people and adults who come into contact with us as church. the safeguarding and protection of all children, young people and adults who are at risk of or experiencing abuse, remembering that people can be vulnerable at different times in their lives. the establishment of safe, caring church communities which provide a loving, inclusive environment where all members accept a responsibility to be vigilant to the potential for abuse, whether physical, emotional, sexual, financial or spiritual, and take appropriate action if it occurs. We carefully select, train and support all those with any responsibility for vulnerable groups within our churches, in line with the principles and procedures set out in “Practice Guidance: Safer Recruitment,” (pub 2015 & updated 2016), including the use of criminal record disclosures and registration with the relevant vetting and barring schemes. 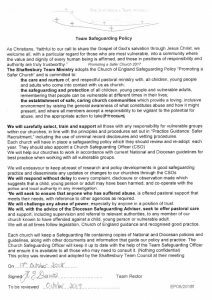 Each church has a safeguarding policy which they review and re-adopt each year. They also appoint a Parish Safeguarding Representative (PSR). We help our churches to work in accordance with current National and Diocesan guidelines for best practice when working with all vulnerable groups. We endeavour to keep abreast of research and policy developments in good safeguarding practice and disseminate any updates or changes to our churches through the PSRs. We will respond without delay to every complaint, disclosure or observation made which suggests that a child, young person or adult may have been harmed, and co-operate with the police and local authority in any investigation. We will seek to ensure that anyone who has suffered abuse, is offered pastoral support that meets their needs, with reference to other agencies as required. We will challenge any abuse of power, especially by anyone in a position of trust. We will seek to offer pastoral care and support, including supervision and referral to relevant authorities, to any member of our church known to have offended against a child, young person or vulnerable adult. We will at all times follow legislation, diocesan guidance and recognised good practice. Each church keeps a Safeguarding file containing copies of “Safeguarding & Practice Guidelines” and “Practice Guidance: Safer Recruitment,” along with other documents and information that guide our policy and practice. 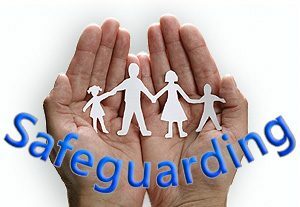 The Parish Safeguarding Representative keeps it up to date with the help of the Team Safeguarding representative and ensures it is available to all those who may need to consult it. This policy was reviewed and adopted by the Shaftesbury Team Council at their meeting on the 17th October 2018, and will be reviewed on October 2019.